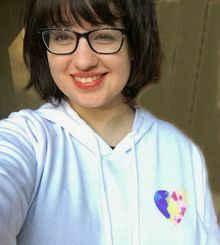 Miss Emily Elizabeth Goff, age 18, of Toccoa, passed away Saturday, April 13, 2019. Born December 29, 2000 in Royston, GA, she was the daughter of Herman Lee and Stacey Shiflet Goff. She was a student and attended Christ Fellowship Church. Family members include her parents, Herman and Stacey Shiflet Goff; sister, Breanna Goff Martinez of Clarkesville; brother, Jacob Andrew Goff of Toccoa; maternal grandparents, Clifford and Cheryl Shiflet of Toccoa; paternal grandparents, Ricky and Janice Goff of Martin. Funeral services will be held at six o'clock Wednesday Evening, April 17, 2019 at Christ Fellowship, Toccoa, GA with the Rev. Dustin Carson officiating. The family will receive friends at the mortuary from 6pm - 8pm Tuesday, April 16, 2019. Add Photos, Videos, Music that tell the story of Emily's life.